Preheat broiler with oven rack 3 inches from heat. Lightly grease rack and pan of a broiler pan . Place wings on rack in broiler pan. Broil 14 minutes or until browned. Lightly grease a 5 Qt. slow cooker, transfer wings. Stir together honey and next 5 ingredients in a small bowl. 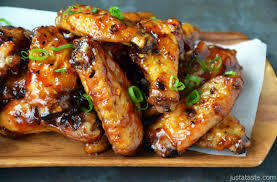 Pour honey mixture over wings, cover and cook on low for 4 hours. Garnish with sliced red peppers, sliced green onions and sprinkle with a few sesame seeds if desired. Great side suggestions is cilantro lime brown rice or steamed carrots and broccoli or both!